We are in full Little House mode over here, and I gotta say, I am loving every minute. As I told Husband last night, our girls may never score a 1600 on their SAT, but my oh my, will they be able to sew, bake, & pickle like nobody’s business! 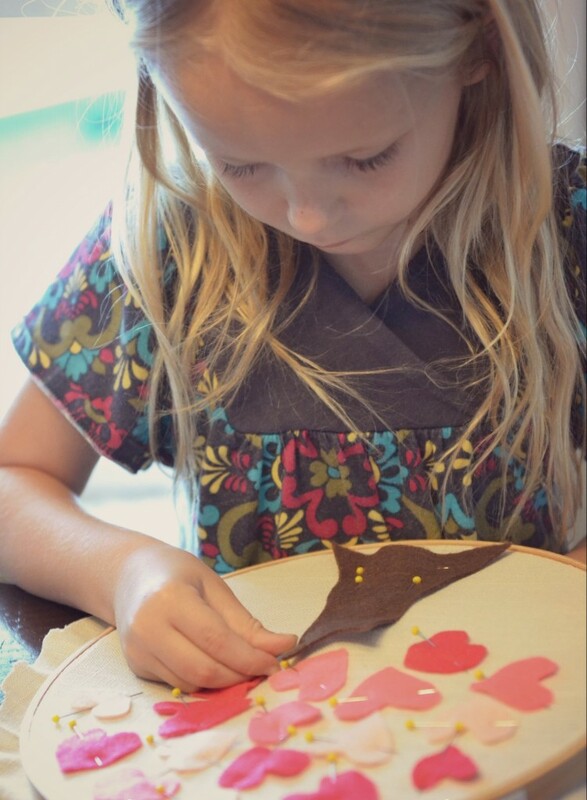 Last week, inspired by one of the projects in the Little House Craft Book, Princess and I took it upon ourselves to learn embroidery. It was something I have never done before either, so we learned together. She was completely hooked almost immediately. I was frankly amazed at how quickly she picked it up! She proudly completed a practice sampler, then begged me to come up with a “real” project we could do. 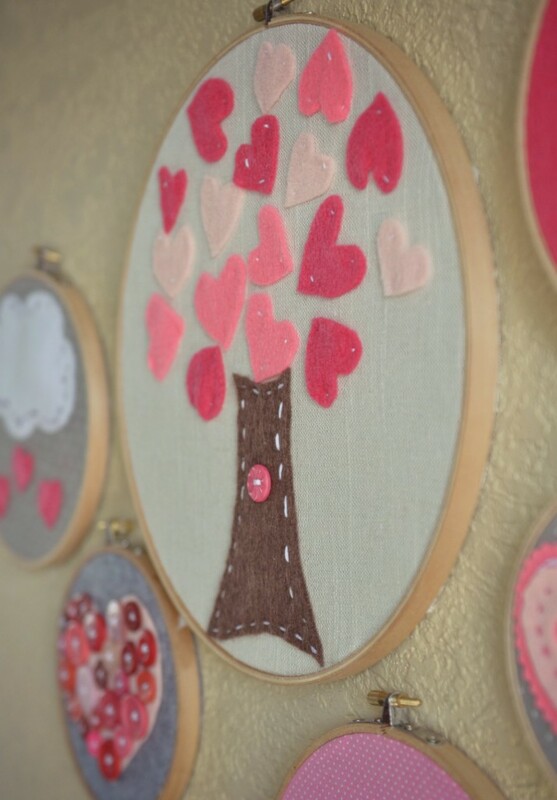 I knew I had seen some cute embroidery hoop art around the web here & there, particularly at Meg’s craft weekend house and of course on Etsy too. I decided we’d try some of our own, Valentine’s Day-style. They turned out SO cute! We pulled out all the felt and fabric and buttons (leftover from this cute-as-a-button baby shower) we could find and got to work. I am not kidding you when I tell you we worked on them for almost 12 hours straight, breaking only to go to dance class. I have never seen Maggie so happy, focused & content. She did three of our six finished hoops almost entirely by herself–the only thing I did was cut out some of the felt pieces and re-thread the needle when necessary. Annie didn’t sew but was greatly entertained by sorting buttons–she spent hours separating them all by color and then helped me arrange and glue them in place on the button heart. You can hear them clinking in the video below. All in all I’d say it was probably the most fun DiY project we’ve ever done together. Who knows? At the rate we’re going, by Valentine’s Day we may have filled up the whole wall! 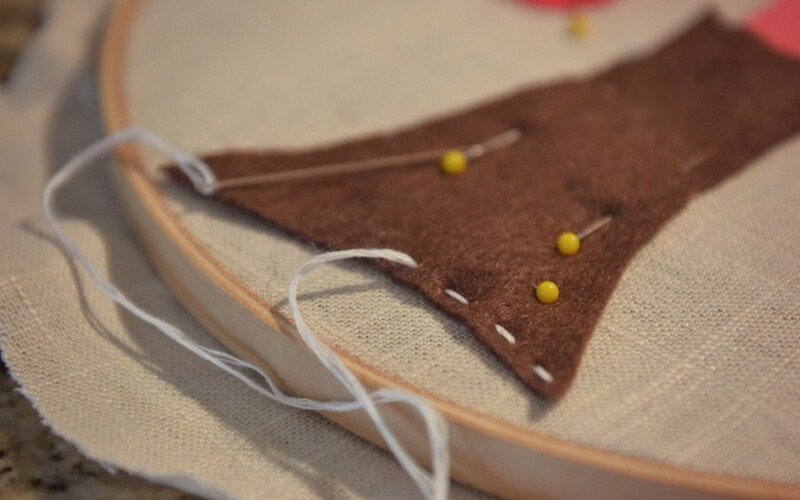 The first step is threading your needle. 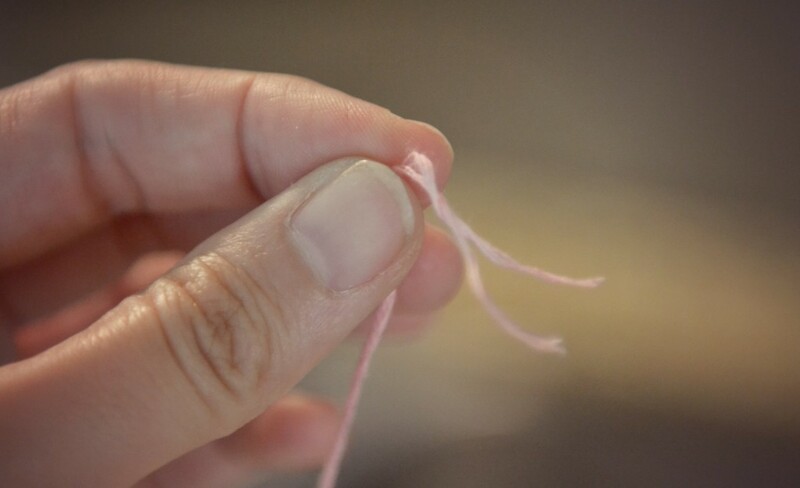 Separate the embroidery thread into two threads of three strands each, then thread one through the eye of the needle until the needle is in the middle of the thread and tie the two loose ends together in a knot. Once you’ve got the various stitches figured out you can decide on your design and choose your background fabric. 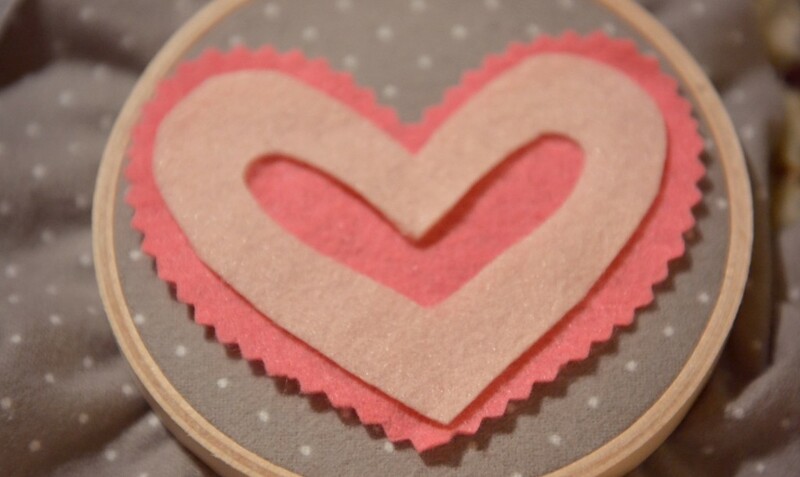 Cut out your felt pieces and pin them in place. This part is pretty simple. If you are adding words, carefully draw them in place with a pen or ultra fine tip marker. You could also use an embroidery pencil, which would then be erasable, but we didn’t have one of those. 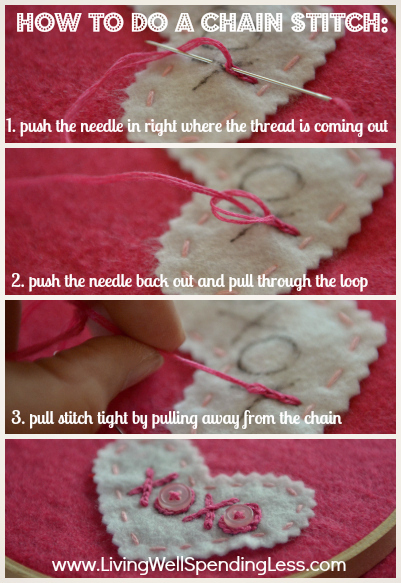 Once you are satisfied with your design, simply stitch all the pieces in place using one of the three techniques shown above. 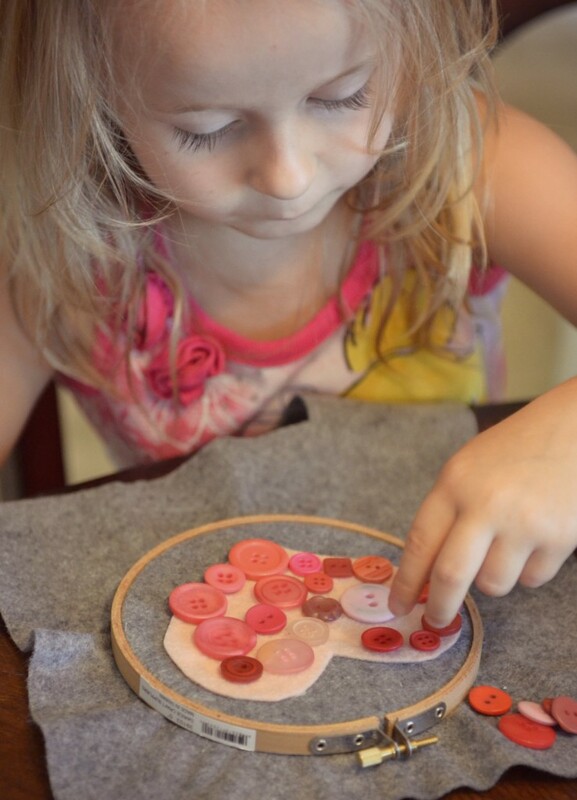 For the button heart we first glued the felt heart to the background with tacky glue, then Annie arranged a variety of pink & red buttons on the heart until she was satisfied with how it looked. We then glued them in place–again with tacky glue–one at a time, until they were all glued in place. Later, once the glue was dry, I stitched all the buttons in place. It turned out just darling! Honestly, I can barely tell the difference between the ones Maggie did and the two I made! Any guesses? Which design do you like best? Oh my goodness, those are SO cute!!!! Princess did such a good job! I love the little video. I can’t wait to show my daughter! 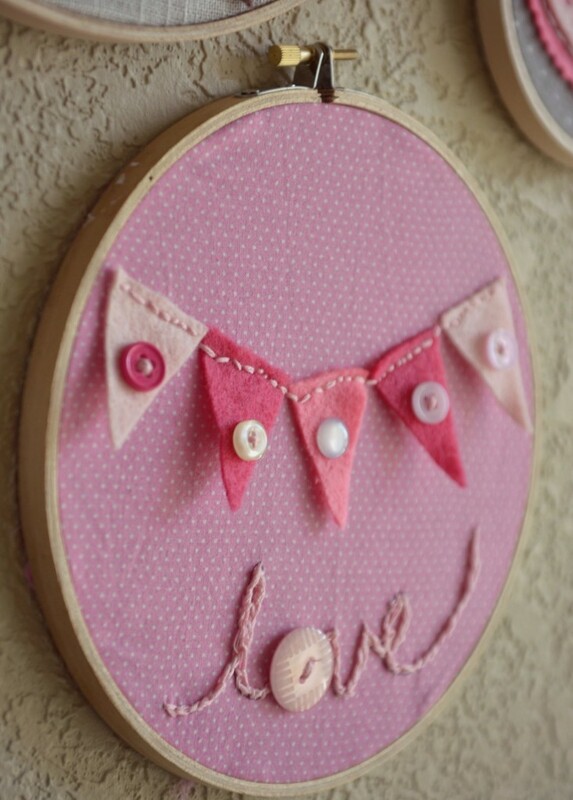 This will be such a fun project us….I am heading to the craft store this morning! Thanks Denise! I was really surprised at how well she did and how long it captured her attention–even my husband was amazed! We did it all afternoon and evening Monday and had to finally force her to bed at 11pm, and she has spent every spare moment doing it since. Let me know how your projects turn out! 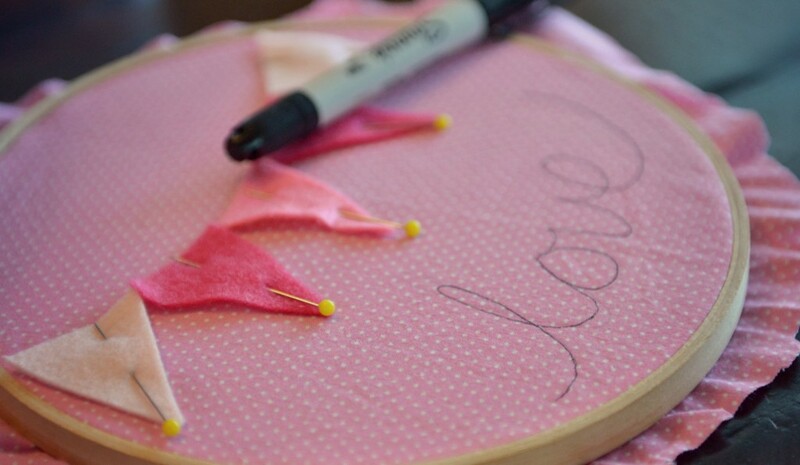 I can not wait until my little one is old enough to manage a needle and thread! 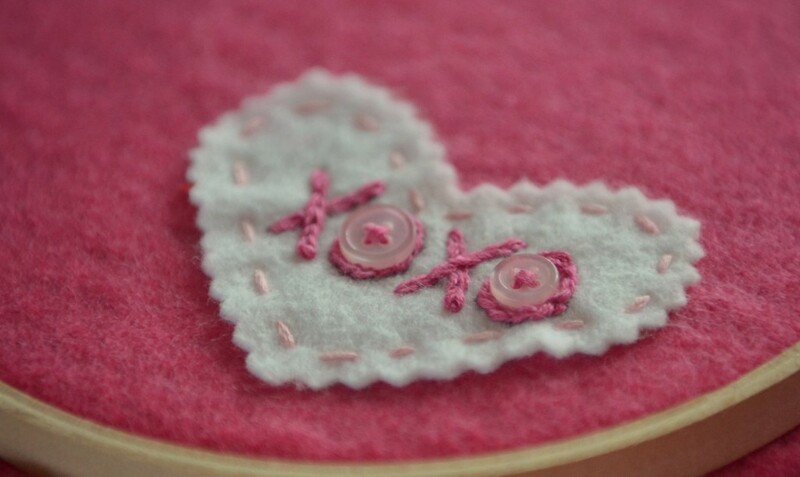 Gorgeous, off to the web to find so cheap embroidery hoops! LOVE them ALL. SO much!! I am so impressed that your daughter was able to do this and stay focused for such a long time. She really did do a great job. Bravo! Ruth!! These are SO. STINKING. ADORABLE. And precious and every other little sweet word I can think of! I love them! I think I like the tree and the little mini banner the best but they are all so cute. Posting about this on FB and pinning. Love it! Love it all! Very cute! Growing up I was huge fan of Little House. I hope to share the stories my daughter, also. Have you checked out the Laura Ingalls Museum website at all? No we haven’t looked at that yet but we WILL! We are planning a trip to the midwest in the spring so I am hoping we can visit some of the Little House sites while we are up there. Thanks for the info! Christina @ I Gotta Create! This is amazingly sweet. Pinning immediately! 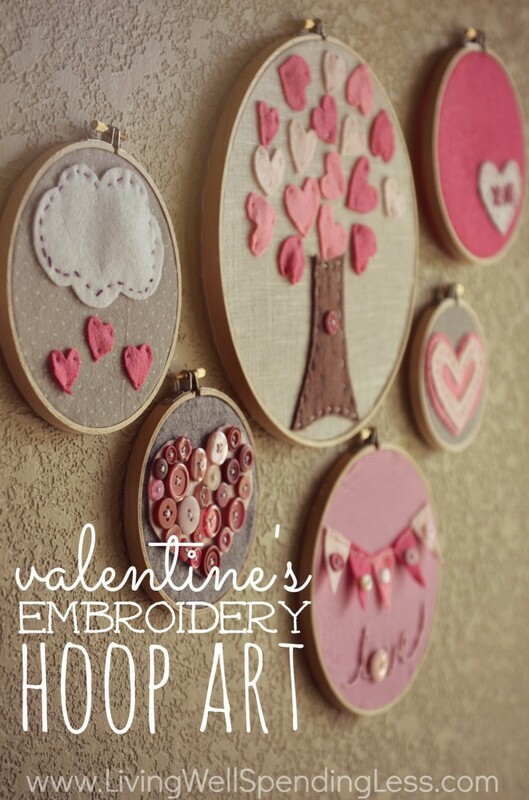 LOVE this craft! 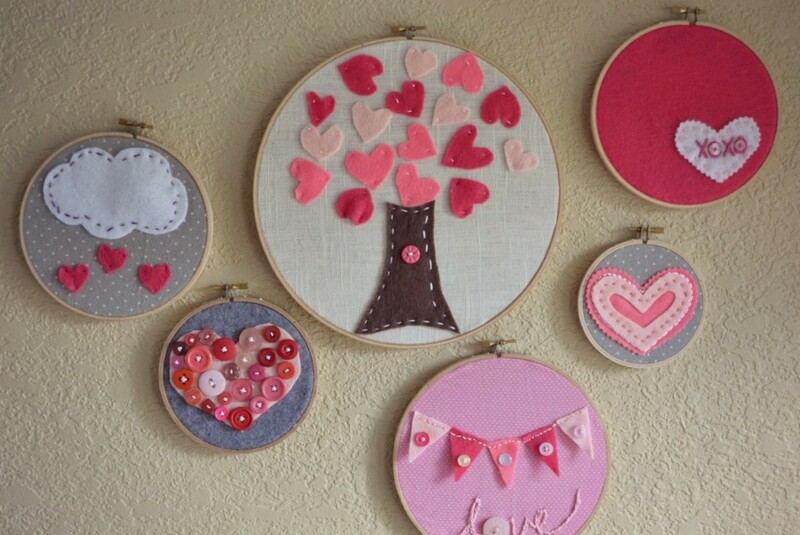 Am in the process of planning the materials so my daughter and I can make this, but am wondering what the dimensions are of the hoops you used? I am terrible at eyeballing measurements and really love the arrangement you made so I don’t want to be too far off. 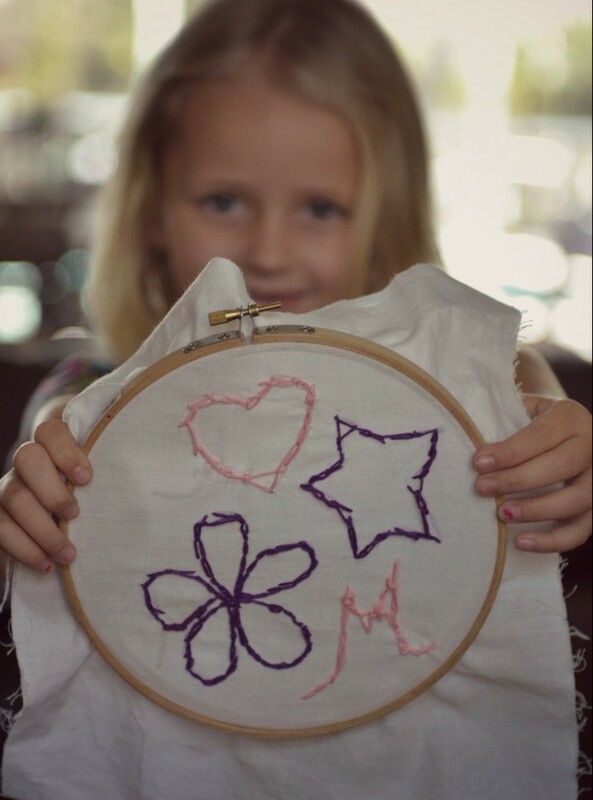 Thanks for sharing this, it will be my first attempt at embroidery as well as my daughters! This was inspiration for my recent entryway update! 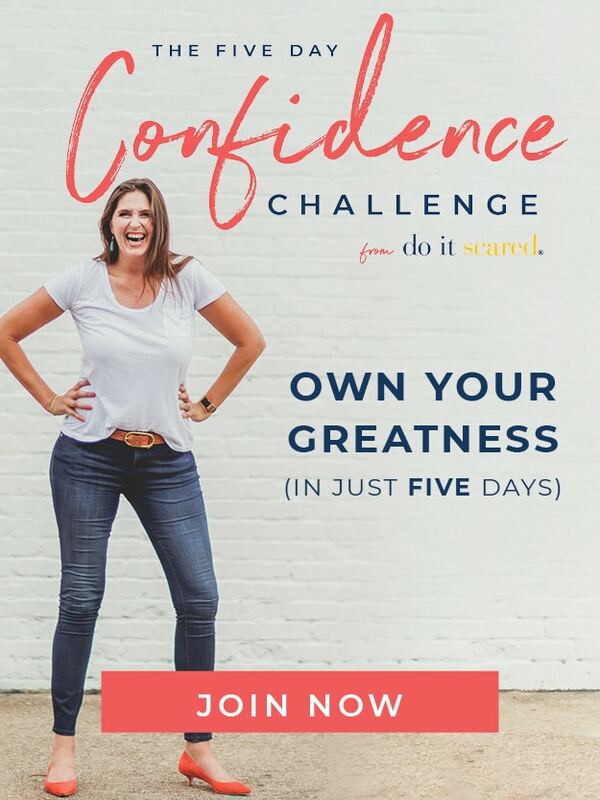 Love your blog so much and this isn’t the first (or last) time I’ll be inspired! Hello There. I discovered your weblog using msn. That is an extremely neatly written article. Oh, these are so cute! I think a couple of my girls could totally do this. I found this post on pinterest and fell in love with Instantly! 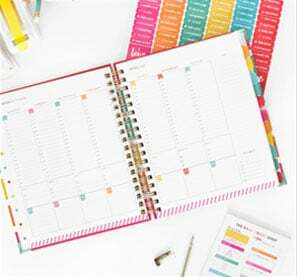 I went out and got all the stuff to make it and am planning on blogging about it (and will link back to your blog) you and your daughter did an amazing job i’m so in LOVE with how they look and am excited to work on my own! I love this, I went and bought some material and felt yesterday. I only had one large wooden hoop and walmart didn’t have any wooden ones. 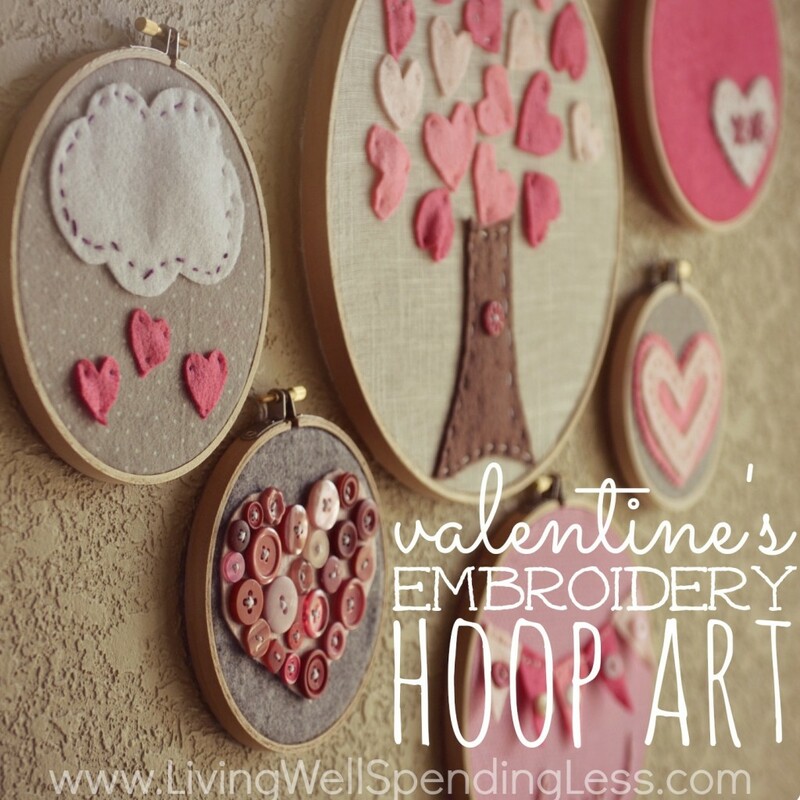 I am making the one with the tree and hope to find some hoops at one of my local thrift stores this week so I can make the other ones too! I live in a small town with no craft stores. I absolutely love these, thank you for sharing! I love, love, love these hoops! 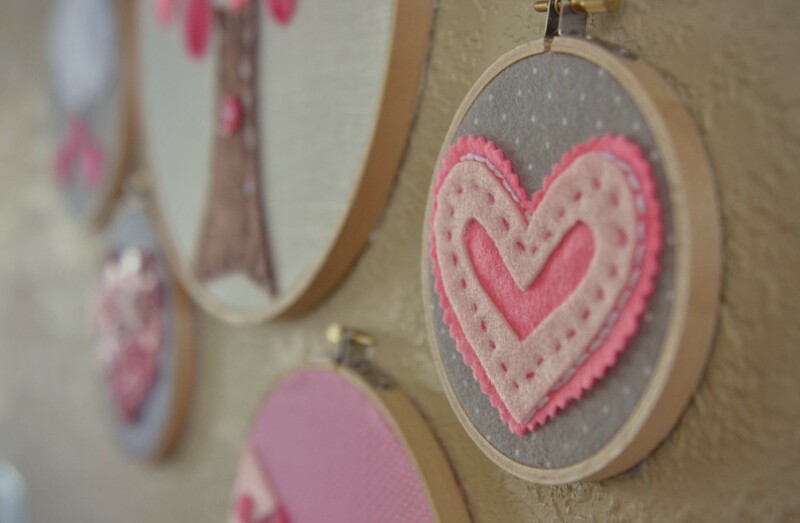 I’ve included a link to your post in my blog post featuring Valentine crafts: http://abusylittlebird.com/8-great-projects-to-make-for-valentines-day/ Thank you! If some one wants expert view concerning blogging afterward i advise him/her to pay a visit this weblog, Keep up the good job.